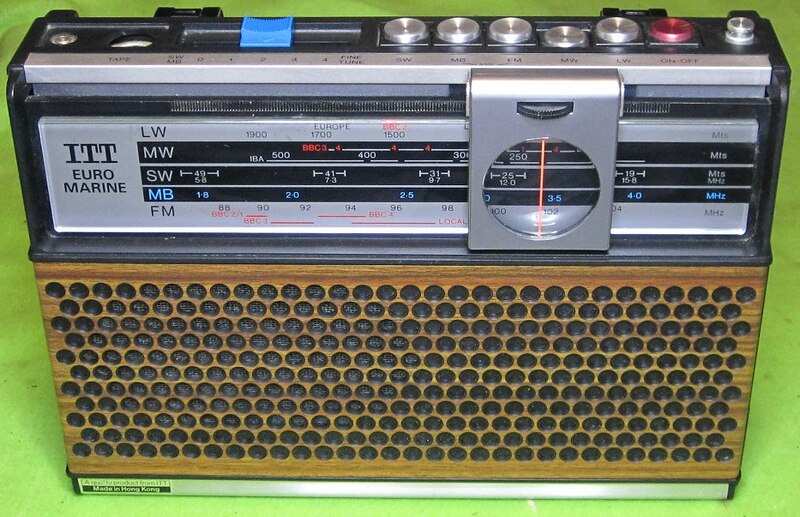 Years ago I had an ITT-KB 'Euromarine' radio which was lost during the move to France. I quite missed it, and have since managed to obtain an ITT-Schaub Lorenz 'Polo' radio which is virtually identical apart from minor 'cosmetic' details. However, I've just noticed that the FM band only goes up to 104MHz. Whereas my old Euromarine covered up to 108MHz. The Polo is a German spec. set, and I'm wondering if the FM band in that country is specified as 88 to 104MHz, or is this an oddity of ITT? Also, it has two SW bands (K1 and K2), where, I think, the Euromarine had one, but I'm not certain..
Last edited by crackle; 17th Apr 2019 at 5:29 pm. Hi, and thanks for your replies. Aha!, so the Euro Marine only went up to 104MHz as well. Something else I hadn't spotted way back then! Another thing that I found out was that if the plastic slider on the AC mains input was slid upwards, another pin was exposed that allowed the radio to work on 110 volts mains. It was very handy on night shifts in a power station where the maintenance supplies were 110 volts. I forgot to add yesterday that I once saw another version of this set with a white case and, I think, a red dial. That one was also on a flea market and, with hind sight, I should have bought it. 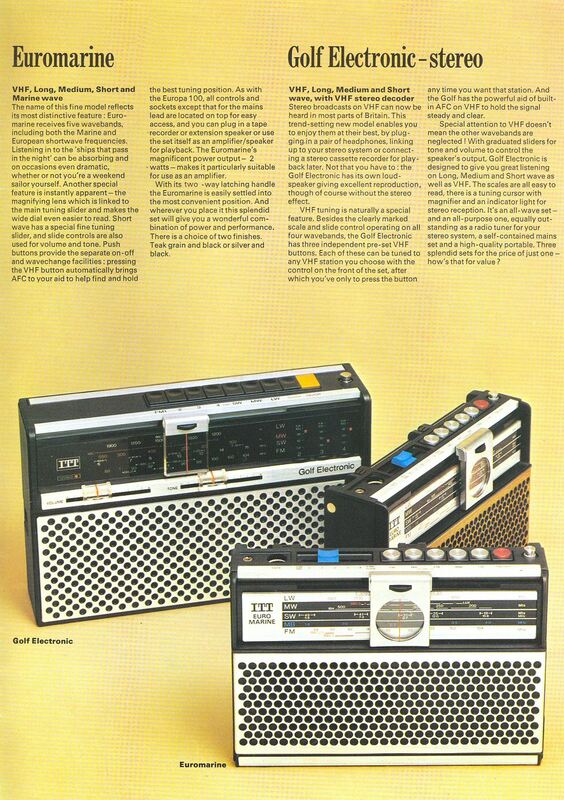 It seems to be one of those radios that have many guises. That is a really nice radio! If you want to increase the FM coverage to 108MHz it probably can be done just by adjusting the trimmer capacitors In the FM-tuner. I was able to do that at two radios that also only went to 104MHz, I did not need to change any components. You need to adjust the FM oscillator and modulator trimmer caps. It does not hurt if you have an FM signal generator. Start at first to adjust the oscillator trim cap, C314, at the top of the band. I found it the safest to "chase out" the frequency slowly, in small steps. Then double check/correct at the low end of the FM-band (88MHz) by adjusting L304. If the trimmer does not allow you to reach the 108MHz frequency, change C313 from 20pF to 16pF - 18pF or so, and then adjust C314. Once you are happy with the frequency coverage, adjust the modulator circuit, the C305 trimmer. For best tracking adjust the modulator circuit at 106MHz first, and then L302 at 90MHz. Again, if the trimmer does not give enough range, change C304 from 27pF to 22pF or so. Then you can update the scale with "Letraset", hopefully you can still find that. If you do not have an FM-generator you can use an accurate, synthesized FM receiver, and commercial stations, or a programmable FM-modulator, used for car radios. And thanks, Peter, for the info. If I can tweak it as far as 106 and a bit Megs, I'll be happy. There's not much above that in Europe worth listening to, and I've got other radios that cover the full band. The Polo is handy for travelling and was dirt cheap at 5 euros, so not really worth changing components. It just seemed odd to end the band at 104.